Voxofon | Voxofon International Rates | Free Calling Credit | Free Pc to Phone Calls, Free Voip Calls to India International ! Mobile voip is really growing. Today we will talk about one more voip provider to make free and cheap international calls. The best part is that many of these mobile voip provider offer free calling credit just on sign up, which can be used to make free international calls. Some of these voip provider even offer free credit on daily or weekly basis to make free calls. We will be discussing about Voxofon voip service today to make calls. If you are having a smartphone then you must be using internet on your mobile. Even if you don't have a smartphone, don't worry you can use PC to make calls : Free PC to Phone Calls. It will be better if you have high speed internet so that the call quality is good, otherwise you may experience some delay in voice. Voxofon is also offering free calling credit all new customers for trying their service. Lets first check some details about Voxofon before we discuss how to get free credit from Voxofon. Make free calls to all Skype and Gtalk contacts (friends). Make free unlimited calls. Make calls via local access number. Very simple procedure. Voxofon offers PIN less dialing feature. Voxofon offers free 50 cents of trial credit to new users. Apps for Smartphones : Voxofon has apps for Android, BlackBerry, iPhone, HP webOS, or Windows Phone 7 smartphones. 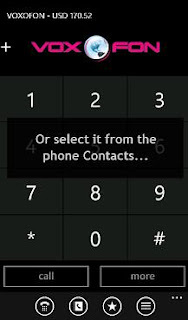 Call your loved ones by dialing them directly through the keypad, no pin codes required. Pc to Phone Calls : Voxofon on PC : Call abroad from your PC and reach friends and family directly from the Voxofon website. You can talk to your contacts using a headset with a microphone attached to your computer. No software needed! Voxofon offers free calling credit worth 50 cents to all new users. However the free credit is given to only USA customers. The procedure is quite simple, just need to register with Voxofon from USA IP to get this free credit. You can use these 50 cents to make about free 30 minutes to India. Install the application on your mobile or PC. Register with voxofon using the application. Once you register with Vofoxon, you will get free credit worth 50 cents to make free calls. Make free calls from smartphone app or local access number or Pc application. If you have any doubts or any concerns about Voxofon, then please share them in comment section.